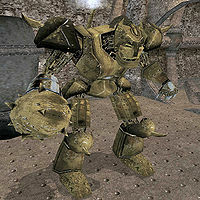 Dwemer Centurions, sometimes referred to as Constructs or Animunculi, are mechanical and magical artifacts often encountered in Dwemer ruins. 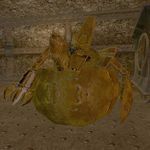 Many of them are still active, even after the many years since the Dwemer's disappearance at the Battle of Red Mountain, and are usually hostile to intruders. It is unknown what drives them, but it is speculated that they are steam-powered, as they feature pipes and vents, from which steam blasts erupt intermittently. They may even house a "boiler" or a similar contraption. Another point of interest is that Centurions taken from Vvardenfell "shut down" after a certain distance between them and Red Mountain is maintained. When brought back into this radius, they activate again. 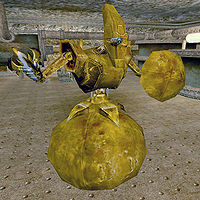 It may be that some sort of signal emanating from the Dwemer's underground colonies keeps the Animunculi active. Nearly all Dwemer Centurions drop Scrap Metal. There are three main types of Dwemer Centurion found in Morrowind. The Centurion Sphere is relatively common in Dwemer ruins. They may have served as guards or war-machines, as their two "arms" feature a sword and shield. Unlike the other two common types of Animunculi, the Centurion Sphere features a complex "eye" component. This is likely for the purpose of targeting, as it must maintain a high level of control over its more complicated and delicate weaponry. It may also be similar to a gyroscope, in that it aids the construct in keeping balance over the sphere beneath it. When idle, the body can be retracted inside the sphere, with the shield forming the cap. This process is shown in the following animation. 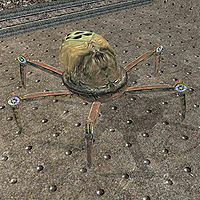 The most common mechanical construct found in Dwemer ruins, Centurion Spiders are aggressive, but are the least dangerous of the Animunculi. They consist of a flexible gas-bag which rests upon a metal base, surrounded by six hinged legs. This material, apparently metallic in nature, may be the "Flesh-Metal" mentioned in the Lessons of Vivec. Poison magicks can be fired at enemies from this bag. It is unlikely that these served as war-machines or guards. They could possibly be maintenance constructs, or perhaps household servants. The underside of the Spider is reinforced to prevent damage from the heated lava floor spaces, which could easily warp untempered metals. Unlike all other existing Dwemer constructs, the Centurion Spiders in the Ald'ruhn Thieves Guild contain souls. The largest and rarest of the Dwemer constructs, the Steam Centurion is designed in the form of an armored warrior. They were most likely produced to be war-machines, as they feature an extendable mace on one arm, which they use predominantly in combat, and on the other a three-fingered hand. They are the most powerful, and probably the most advanced, construct found in the game. The book Ruins of Kemel-Ze implies that the constructs have a weakness to frost and magic attacks, due to the water/steam that drives them. In actual gameplay, however, they are very resistant to magical attacks, frost included. Secrets of Dwemer Animunculi - Diagrams of a Sphere Centurion in various stages. This page was last modified on 8 February 2018, at 00:23.